I am particularly impressed and pleased to see how well attended this meeting is. I would like to express my sincere appreciation to Luiza Hoxhaj, executive director of the Center for European Policy Studies for Regional and Local Development, the host of the 3rd Forum on Regional and Local Economic Development, who did a great job. It is the third Forum organised in the city of Vlore. I remember very well when (October 2016), together with the Academy Board members and your team we decided to invest in this format to take things that already happen, to another level. The first Forum was supported by the EAR-AER and organised by CRLDS. The Forum received the academic support from the University Ismail Qemali of Vlorë, and logistic support from the Regional Council of Vlorë Region, Vlorë Municipality, Regional Youth Center of Vlorë and the Government of Flanders and was organise in the town hall of Vlorë municipality in the presence of the mayor, Mr. Dritan Leli. It is an honour to welcome again Mr. Dritan Leli, Mr. Flamur Mamaj, the prefect of Vlore, Mrs Blerina Brami, University of Padua Italy, Mrs Rezarta Agaliu, president of Legambiente Vlorë. Thank you very much for being here today and also for your participation and contribution in Romania. We look forward having you again in the academy events. I also have the pleasure welcome a delegation of the Department of Regional Development from the University of National and World Economy Sofia, Bulgaria, led by professor Georgi Nikolov. I know you have travelled far – and your concerns truly are at the heart of our work. Launched three years ago, the forum is now more active than ever, and I believe that if we keep focusing on our common interests, we can overcome obstacles. Cooperation on practical projects can create the space for dialogue on other issues that are not part of this Forum, but that can be tackled in a cooperative manner. Every year, the Forum brings together regional, urban and rural stakeholders from all over Western Balkans and Europe to discuss the latest developments relevant to regional and urban policy. I think the audience today confirms the growing interest for “The future of the EU integration of Western Balkans countries and the role of the regions and cities”, and the opportunity it represents. We have the chance to discuss practical cooperation on issues that matter to our citizens’ daily lives. We all know that discussing about cooperation is never enough, but it is the starting point that can also allow us to increase mutual understanding and further capitalise on it, by creating a space for dialogue and cooperation on concrete projects. In my capacity as alternate member of EESC I would like to inform you that the EESC` Western Balkans Follow-up Committee went to Tirana between 24-25 September to meet representatives of Albanian civil society and to discuss the state of social dialogue in Albania. In the view of the possible start of EU accession negotiations with Albania in 2019, it was stressed that civil society, including youth organisations and the social partners, should be genuinely involved in all stages of the accession process. The meetings were held in preparation for the 7th EESC Western Balkans Civil Society Forum, to take place in 2019. The EESC’s Western Balkans Follow-up Committee intends to share the main conclusions from the mission with other EU institutions. 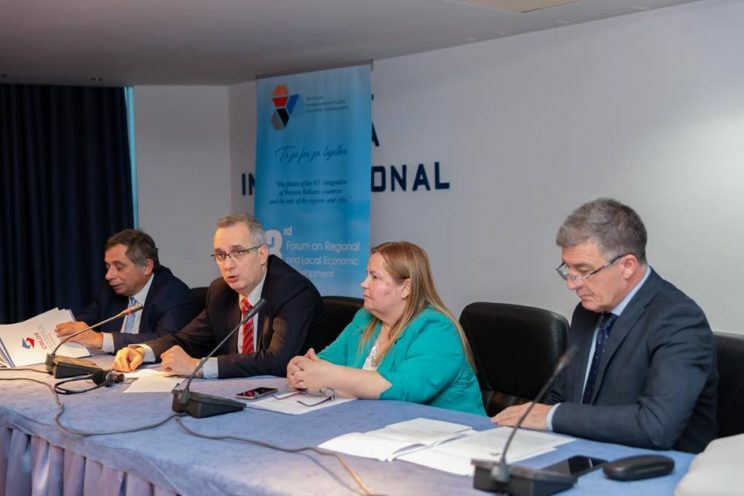 You may be aware that the Working Group on the Western Balkans of the other EU consultative body, the European Committee of the Regions, met in Tirana last week, (13 November) when they discussed about municipal reform. Furthermore, you may also wish to be informed that the COR recently published an overview of EU financial assistance available to local and regional authorities from enlargement countries. This completes the EU institutional overview, because I am not here to repeat the “big talk”, but rather to provide information which may be useful, but is not necessarily making the headlines. I will now hand over to the academy speakers today, honorary member Henri Malosse,the 30th President of EESC, will elaborate during his intervention on the “Territorial European cooperation’s perspectives under the new multiannual Financial perspectives 2021-2027”, on how the European Union is translating political commitment into operational cooperation, including some of the budgetary issues, board member dr. Reinhard Eichweber will explain the guidelines on health services and the access of medicine to the European market during his intervention later on. Let me thank you once again for your participation and contribution to the Forum, thank the Government of Flanders for their financial support in the last 3 years and wish us all fruitful discussions!